Choosing the best landscape design service for your project in Bergen County requires careful attention. The design stage of the landscaping process influences each subsequent step of your residential or commercial project. Begin the project by getting your own thoughts together. Clip photos from magazines, take pictures of neighborhood properties and write down or sketch a design of what you envision. The better the communication the better the end result. A professional service has the know-how to create a space that matches your dreams. Combining a portfolio of completed projects, drawing capability and, perhaps, the ability to listen to the client is critical to bringing your ideas to life. Don’t be afraid to admit that you’re overwhelmed. A great landscape design service is ready, willing and able to offer innovative ideas that look beautiful and match your lifestyle. Once you know what you want, it’s time to assemble a short list of local companies. Talk to your neighbors and friends to get referrals. Ask your neighbor who did their landscaping design and go online to check their reviews and testimonials. Next, narrow down your list to two or three professionals from whom you will request a formal bid. Education and experience- Ask the chosen contractors to provide a list of references. Browse their portfolios and check their websites. Use the internet to get additional information. 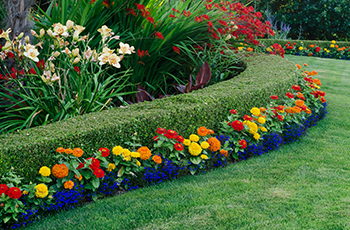 Cost- Choose a landscape designer who can meet your design sensibility and your budget. Licensing and Bonding- Check with the Bergen County or New Jersey Landscape Contractors Board and make sure your potential bidders carry the appropriate licenses and bond to perform the work you need. No license or bond? Move on to another company. Liability insurance- Never hire a contractor without the appropriate amount of liability insurance. Reviews and Testimonials – look on line and on their website for reviews and testimonials. Then read and compare them to the other landscape designers you are considering. Trust- A landscaping design project can be a big investment. Make sure you have complete trust in your contractor of choice to perform up to your standard. If not, you could end up with a hefty repair project a few years down the road. In Bergen County, you can avoid hiring lackluster landscape design services by following the tips listed above.